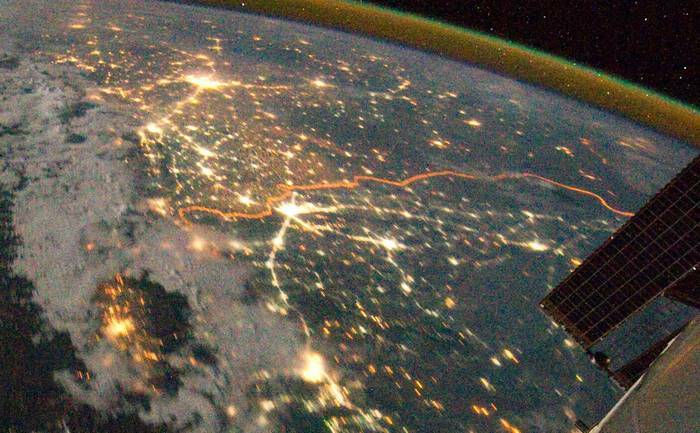 Update 20110925-pm(Asia): NASA has said that UARS fell back to Earth between 11:23 p.m. EDT Friday, Sept. 23 and 1:09 a.m. Sept. 24. UARS fell back 20 years and nine days after its launch on a 14-year mission that produced some of the first long-term records of chemicals in the atmosphere. NASA has said the precise re-entry time and location of debris impacts have not been determined. During the re-entry period, the satellite passed from the east coast of Africa over the Indian Ocean, then the Pacific Ocean, then across northern Canada, then across the northern Atlantic Ocean, to a point over West Africa. The vast majority of the orbital transit was over water, with some flight over northern Canada and West Africa. There have been a host of claims concerning the fall of UARS. SPACE.com has said it was flooded with emails from people claiming to have seen the spacecraft’s descent or to report potential debris sightings, but agency officials said these cases are unlikely. So far, NASA has not received any credible reports of debris, or of people on the ground who think they may have observed UARS burning up on its way through the atmosphere. “Most of the time we do rely heavily on people on the ground,” Nick Johnson, chief orbital debris scientist at NASA’s Johnson Space Center in Houston, told reporters in a news briefing Saturday (Sept. 24). “UARS, whether it came in during the local day or local night, would have clearly been visible.” Johnson said there were some people along the western coast of North America that were hoping to capture views of the dying satellite. Since the agency did not receive any plausible reports, this would further suggest that UARS did, in fact, splash down in the ocean without ever reaching North America. Reuters has reported that at 35 feet long and 15 feet in diameter, UARS was among the largest spacecraft to plummet uncontrollably through the atmosphere, although it is a slim cousin to NASA’s 75-tonne (68,000 kilogram) Skylab station, which crashed to Earth in 1979. Russia’s last space station, the 135-tonne (122,000 kilogram) Mir, crashed into the Pacific Ocean in 2001, but it was a guided descent. NASA now plans for the controlled re-entry of large spacecraft, but it did not when UARS was designed. Six years after the end of its productive scientific life, UARS broke into pieces during re-entry, and most of it up burned in the atmosphere. Data indicates the satellite likely broke apart and landed in the Pacific Ocean far off the U.S. coast. Twenty-six satellite components, weighing a total of about 1,200 pounds, could have survived the fiery re-entry and reach the surface of Earth. However, NASA is not aware of any reports of injury or property damage. The Operations Center for JFCC-Space, the Joint Functional Component Command at Vandenberg Air Force Base, Calif., which works around the clock detecting, identifying and tracking all man-made objects in Earth orbit, tracked the movements of UARS through the satellite’s final orbits and provided confirmation of re-entry. Update 20110924-pm(Asia): UARS has landed. NASA’s decommissioned Upper Atmosphere Research Satellite fell back to Earth between 11:23 p.m. EDT Friday, Sept. 23 and 1:09 a.m. EDT Sept. 24. The Joint Space Operations Center at Vandenberg Air Force Base in California said the satellite penetrated the atmosphere over the Pacific Ocean. 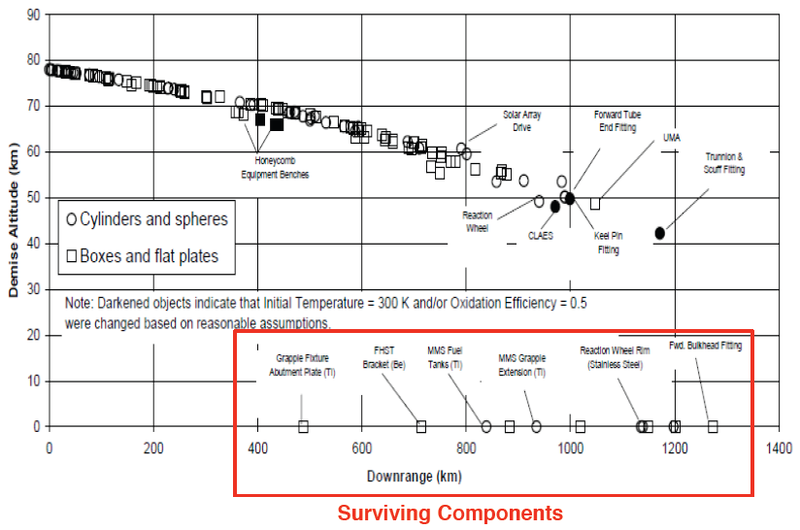 The precise re-entry time and location are not yet known with certainty (from NASA Update No. 15). Update 20110924: New updates from NASA on the re-entry path of UARS and possible times of re-entry. Background on predictive models of space debris. Description on kinds of debris that may be expected. NASA Update No. 11 – the orbit of UARS was 90 miles by 95 miles (145 km by 150 km). Re-entry is expected between 11 p.m. Friday, Sept. 23, and 3 a.m., Sept. 24, Eastern Daylight Time (3 a.m. to 7 a.m. GMT). During that time period, the satellite will be passing over Canada, Africa and Australia, as well as vast areas of the Pacific, Atlantic and Indian oceans. The risk to public safety is very remote. To foresee the paths of space junk so that collisions can be avoided, NASA developed one of the world’s most sophisticated predictive models, as Technology Review has explained. Called Legend (for “low-Earth to geosynchronous environment debris”), the three-dimensional model simulates the routes of all trackable space objects and even factors in new debris from future crashes. To take uncertainty and randomness into account, hundreds of scenarios are generated using the Monte Carlo method, a set of algorithms that can calculate risk factors in a complex environment. With Legend, NASA scientists use the average of multiple simulations to estimate the number, size, and type of objects that will collide—and approximately how often. Unlike models used by the U.S. Strategic Command Joint Space Operations Center, which detects and tracks large objects and screens active satellites daily for possible collisions within 72 hours, Legend includes smaller fragments and looks far into the future. 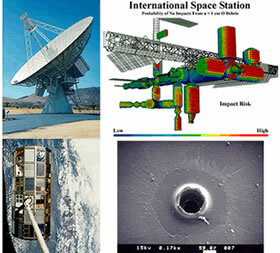 In place since 2004, the NASA model is constantly fed with data gathered from the results of ground tests and spacecraft that have broken up in orbit; from telescopes and radars viewing the sky; and from analysis of crater-marked spacecraft surfaces that have returned to Earth. That means new simulations must be run continually. Legend enables scientists to calculate the consequences of a particular breakup or collision and helps them alert managers at the space station that a piece of debris could be in its path. The model also advises soon-to-launch satellites of areas to avoid and will guide scientists as they attempt to develop and launch debris removal technology for the first time. Earlier: First, get the data from the owners, NASA. Second, read the onlnie news and watch TV, but keep track of what the orbital experts are saying – Space Track, Space Data Source, NASA’s Orbital Debris Program Office, the Joint Space Operations Center of U.S. Strategic Command. 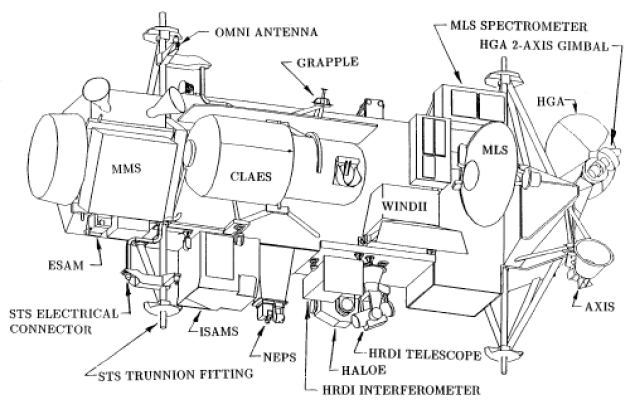 Third, keep handy some basics about the falling satellite (a few pointers follow). NASA’s latest update: As of 10:30 a.m. EDT on Sept. 23, 2011, the orbit of UARS was 100 miles by 105 miles (160 km by 170 km). Re-entry is expected late Friday, Sept. 23, or early Saturday, Sept. 24, Eastern Daylight Time. Solar activity is no longer the major factor in the satellite’s rate of descent. The satellite’s orientation or configuration apparently has changed, and that is now slowing its descent. 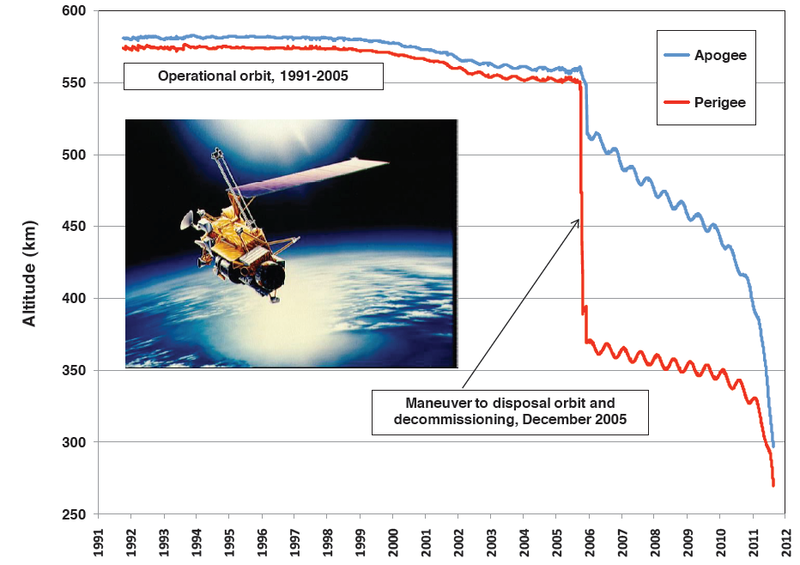 There is a low probability any debris that survives re-entry will land in the United States, but the possibility cannot be discounted because of this changing rate of descent. It is still too early to predict the time and location of re-entry with any certainty, but predictions will become more refined in the next 12 to 18 hours. NASA has been posting updates daily until about 24 hours before re-entry, and then at about 12 hours, six hours and two hours before re-entry. The updates will come from the Joint Space Operations Center of U.S. Strategic Command at Vandenberg Air Force Base, Calif., which works around the clock detecting, identifying and tracking all man-made objects in Earth orbit, including space junk. As of Sept. 8, 2011, the orbit of UARS was 152 miles by 171 miles (245 km by 275 km) with an inclination of 57 degrees. 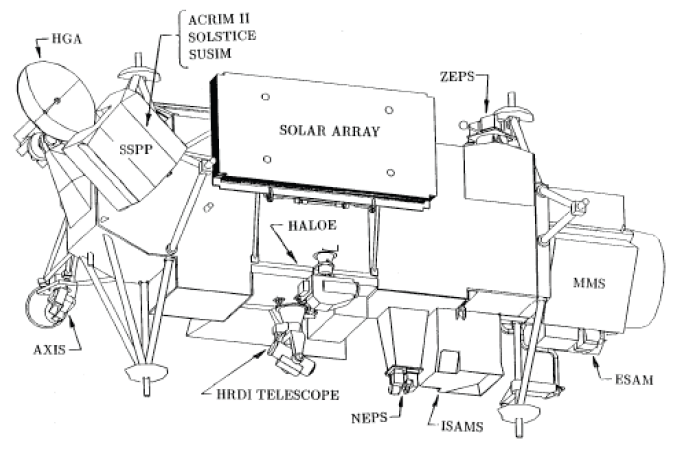 Because the satellite’s orbit is inclined 57 degrees to the equator, any surviving components of UARS will land within a zone between 57 degrees north latitude and 57 degrees south latitude. It is impossible to pinpoint just where in that zone the debris will land, but NASA estimates the debris footprint will be about 500 miles long. Advice: If you find something you think may be a piece of UARS, do not touch it. Contact a local law enforcement official for assistance. The official source of reentry predictions for uncontrolled space objects is USSTRATCOM’s Joint Space Operations Center (JSpOC). Normal procedure is for TIP (Tracking and Impact Prediction) messages to be prepared and released to the public (via the Space-Track.org website) at the following intervals: – T-4 days, T-3 days, T-2 days, T-1 day, T-12 hours, T-6 hours, and T-2 hours. minutes for nearly circular orbits. This equates to +/- 12,000 km on the Earth. A final, post-reentry assessment message is normally issued within a few hours of reentry. 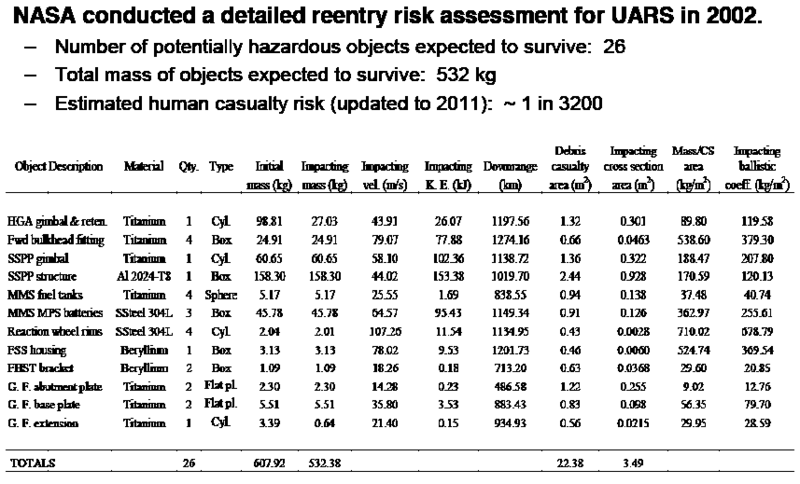 This reentry prediction comes from the ‘Re-entry and Risk Assessment for the NASA Upper Atmosphere Research Satellite (UARS)’ document [get it here, pdf], NASA Orbital Debris Program Office, Lyndon B. Johnson Space Center. 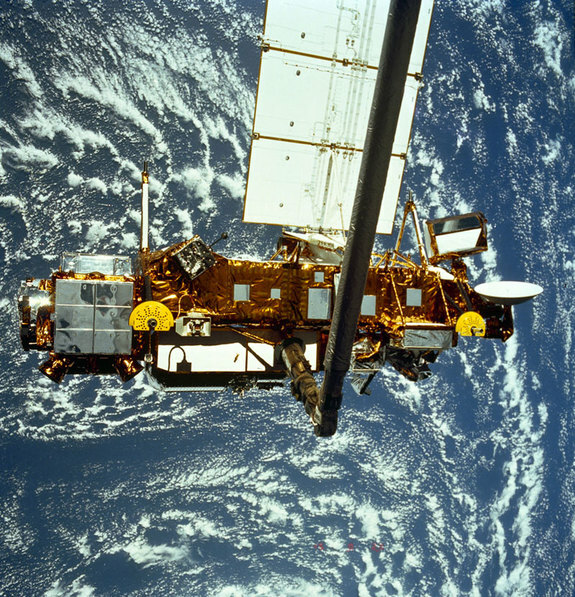 NASA’s UARS satellite, launched in 1991 from the Space Shuttle, was the first multi-instrumented satellite to observe numerous chemical constituents of the atmosphere with a goal of better understanding atmospheric photochemistry and transport. In July 2011, the US National National Oceanic and Atmospheric Administration‘s (NOAA) National Climatic Data Center updated the Climate Normals for the USA.These are three-decade averages of weather observations, including temperature. The new annual normal temperatures for the United States reflect a warming world. Following procedures set by the World Meteorological Organization, normals shift each decade, rather than each year. As of July 2011, the climate normals span 1981–2010, dropping the 1970s, which were unusually cool. Last year, the normals included 1971–2000, leaving out the warmest decade on record (2001–2010). NASA’s Earth Observatory has provided maps which show the differences between the old normals and the new normals. The top image shows July maximum temperatures, and the lower image shows the January minimum temperatures. Positive temperature changes appear in orange and red, and negative temperature changes appear in blue. On average, the contiguous United States experiences the lowest temperatures on January nights, and the highest temperatures on July days. Both January minimum temperatures and July maximum temperatures changed, but not by equal amounts. 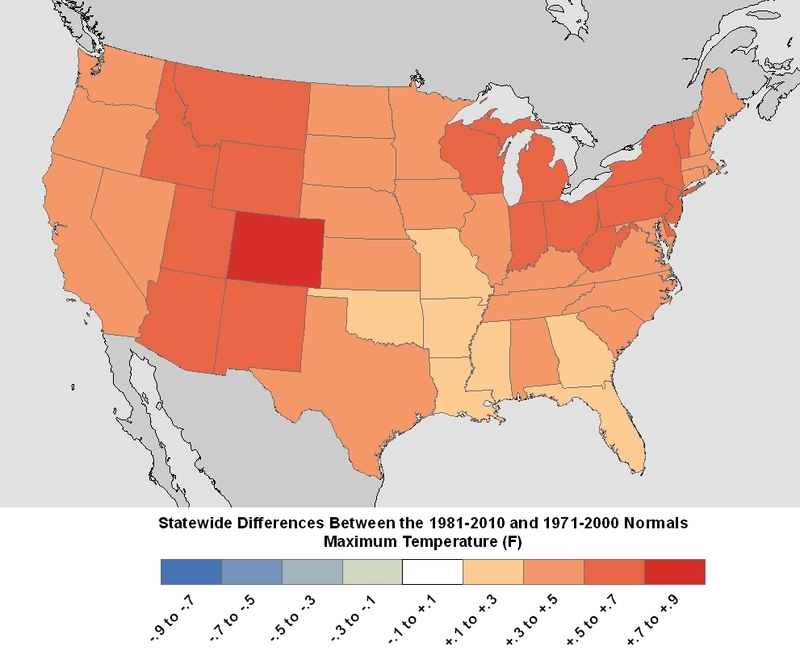 Parts of the Great Plains, Mississippi Valley, and the Northeast experienced slightly cooler July maximums from 1981–2010 compared to 1971–2000 (top map). A much more striking difference, however, appears in the January minimums (lower map). Nighttime temperatures in January were higher everywhere except the Southeast. Warmer nights were especially pronounced in the northern plains through the northern Rocky Mountains—several degrees warmer in some places. 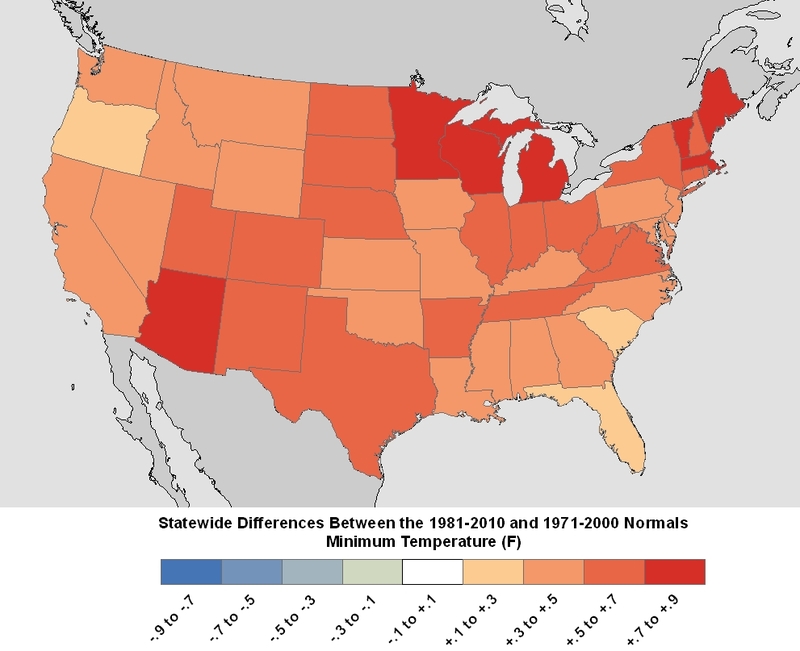 Comparing average temperatures year round, every state experienced warmer temperatures in 1981–2010 compared to 1971–2000. NOAA’s National Climatic Data Center (NCDC) released the 1981-2010 Normals on July 1, 2011. Climate Normals are the latest three-decade averages of climatological variables, including temperature and precipitation. This new product replaces the 1971-2000 Normals product. Additional Normals products; such as frost/freeze dates, growing degree days, population-weighting heating and cooling degree days, and climate division and gridded normals; will be provided in a supplemental release by the end of 2011. Although warmer temperatures can have benefits, they pose hazards to some plants. For instance, higher nighttime temperatures enable some pests—such as the pine bark beetle and wooly adelgid—to thrive in places where they previously froze. What are Normals? – In the strictest sense, a “normal” of a particular variable (e.g., temperature) is defined as the 30-year average. For example, the minimum temperature normal in January for a station in Chicago, Illinois, would be computed by taking the average of the 30 January values of monthly-averaged minimum temperatures from 1981 to 2010. Each of the 30 monthly values was in turn derived from averaging the daily observations of minimum temperature for the station. In practice, however, much more goes into NCDC’s Normals product than simple 30-year averages. Procedures are put in place to deal with missing and suspect data values. In addition, Normals include quantities other than averages such as degree days, probabilities, standard deviations, etc. 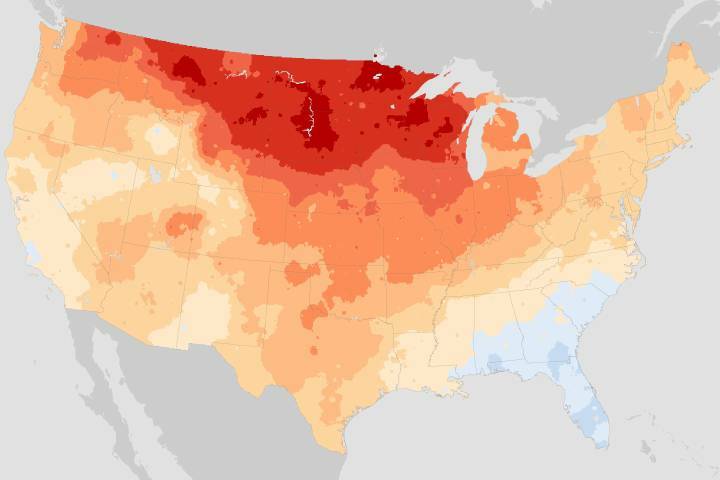 Normals are a large suite of data products that provide users with many tools to understand typical climate conditions for thousands of locations across the United States. What are Normals used for? – Meteorologists and climatologists regularly use Normals for placing recent climate conditions into a historical context. NOAA’s Normals are commonly seen on local weather news segments for comparisons with the day’s weather conditions. In addition to weather and climate comparisons, Normals are utilized in seemingly countless applications across a variety of sectors. These include: regulation of power companies, energy load forecasting, crop selection and planting times, construction planning, building design, and many others. 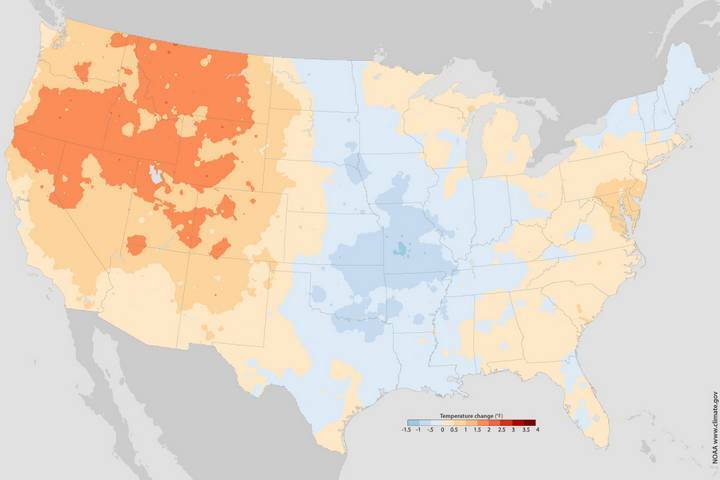 The National Climatic Data Center compiles climate normals from observations from thousands of stations in the National Weather Service (NWS) Cooperative Observer Program, as well as stations staffed by professionals within the NWS, the National Oceanic and Atmospheric Administration (NOAA), and the Federal Aviation Administration. 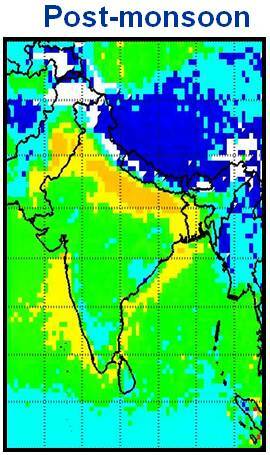 Data from the Multi-angle Imaging Spectroradiometer (MISR) instrument on NASA’s Terra spacecraft have been used in a new study that examines the concentration, distribution and composition of aerosol pollution over the Indian subcontinent. The study documents the region’s very high levels of natural and human-produced pollutants, and uncovered surprising seasonal shifts in the source of the pollution. 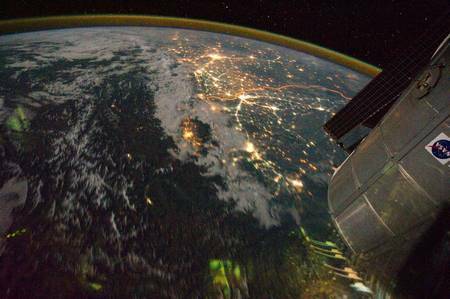 Larry Di Girolamo and postdoctoral scientist Sagnik Dey of the University of Illinois, used a decade’s worth of MISR data to comprehensively analyse aerosol pollution over the Indian subcontinent. 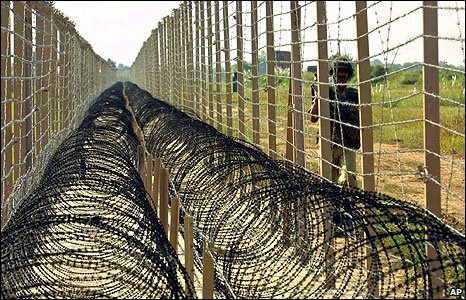 This densely populated region has poor air quality and lacks on-the-ground pollution monitoring sites. The study was published recently in the Journal of Geophysical Research. The NASA report said that aerosols — tiny particles suspended in the air — are produced both by natural sources, such as dust and pollen carried on the wind, and by human activities, such as soot and other hydrocarbons released from the burning of fossil fuels. They can affect the environment and human health, causing a range of respiratory problems. Aerosol pollution levels can be measured on the ground, but only the most developed countries have widespread sensor data. 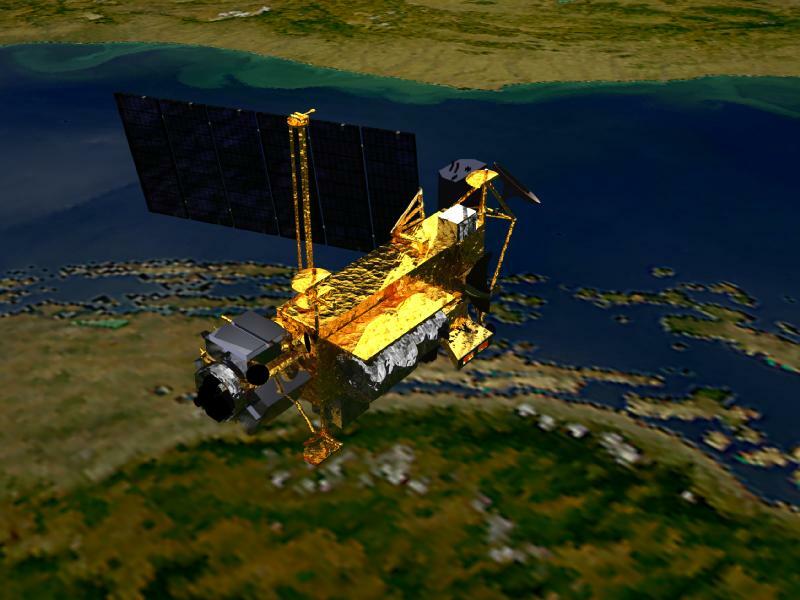 Since standard satellite imaging cannot measure aerosols over land, Di Girolamo and Dey used NASA’s MISR, developed and managed by NASA’s Jet Propulsion Laboratory. MISR’s unique multi-view design allows researchers to differentiate surface variability from the atmosphere so they can observe and quantitatively measure particles in the air. MISR not only measures the amount of aerosols, but can also distinguish between natural and human-produced particles. The scientists found very high levels of both natural and human-produced aerosol pollutants. The level of atmospheric pollution across most of the country was two to five times higher than World Health Organization guidelines. But the study also revealed some surprising trends. For example, the researchers noticed consistent seasonal shifts in human-produced versus natural aerosols. 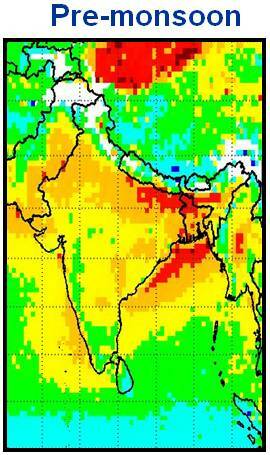 Before monsoon season begins, the winds over the Indian subcontinent shift, blowing inland instead of out to sea. 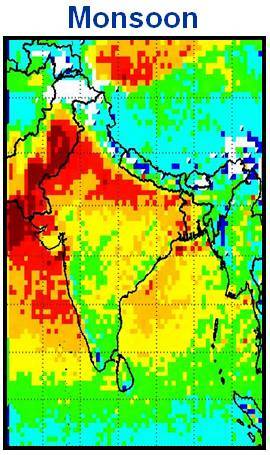 These winds carry immense amounts of dust from Africa and the Arabian Peninsula to India, degrading air quality. During monsoon season, rains wash some of the dust and soot from the air, but other human-produced pollutants continue to build up. After monsoon season, dust transport is reduced, but human-produced pollutant levels skyrocket, as biomass burning and the use of diesel-fueled transportation soar. During winter, seaward-blowing breezes disperse all the pollutants across the subcontinent and out to sea, where they remain until the pre-monsoon winds blow again. 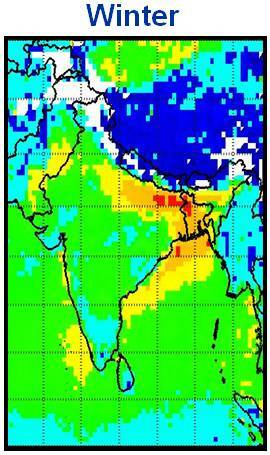 As MISR continues to collect worldwide aerosol data, Di Girolamo says atmospheric scientists will continue to refine models for India and other areas and begin to propose new regulatory measures. The MISR data may also reveal trends in aerosol concentration over time, which can be compared with climate and health data. For further information, read the complete University of Illinois news release. 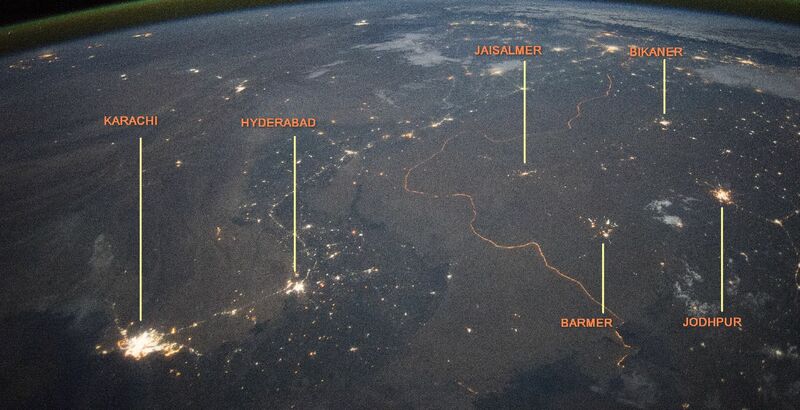 The images represent MISR data used to measure the concentration of aerosol pollutants over the Indian subcontinent and how it varies by season. The most polluted areas are depicted in red. Image credits: NASA/JPL-Caltech/University of Illinois.